This is a two-part article by Leong Sze Hian and I where we analysed Budget 2014 and reveal that even in Budget 2014, the Singapore government is still not spending a single cent for Singaporeans, but not only that, are earning from us at the same time. Yesterday, we had showed you that in Budget 2014, what the government would spend for Singaporeans on our education fees is still far short of what they would spend for international students. We had also showed you that even though the government had announced health initiatives under the Pioneer Generation Package, Medisave top-ups and more subsidies for healthcare, but when you add these all up, what they are spending is still far lesser than what they would be making us pay through higher Medisave contributions. Today, we take a look at the bigger picture and look at what Singaporeans are made to pay, and look at how much the government is actually giving back – is the government still not spending a single cent? In 2014, Singaporeans are expected to pay $8.8 billion in personal income tax. Singaporeans have been told that we pay low personal income tax, but is this the case when we include indirect taxes and our CPF contributions (which is like a social security tax in other countries). We had also contributed $28.5 billion into CPF in a year in 2013 . Also, as we have discussed before, Singaporeans only receive 2.5% to 4% interest (plus 1% on the first $60,000) on our CPF. However, our CPF is utilised by the Government and much of it might end up to be represented in the reserves, which are invested by GIC, Temasek Holdings and MAS. GIC and Temasek Holdings earned returns of 6.5% (in US$ terms) and 16% since inception, respectively. This means that the excess returns that is earned from our CPF is actually not returned to Singaporeans – we estimate that there is about a 3% interest that is not returned to Singaporeans – or what is known, arguably as an implicit tax. 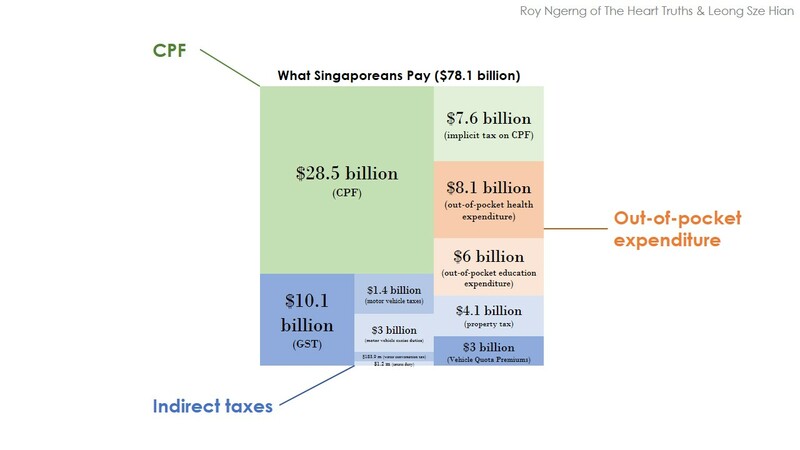 We calculate that this implicit tax that Singaporeans are paying would amount to about $7.6 billion per year (or 3% of the total CPF balance of $253 billion). What this means is that what we pay into CPF in a year may be more than 4 times what we pay into personal income tax! In addition, we had previously compared Singapore with the Nordic countries – we had compared with these countries because they are known to pay the highest taxes in the world. However, in the Nordic countries, their citizens would need only pay into tax and social security (our version is CPF), and be able to receive healthcare and education for next to nothing. However, in Singapore, Singaporeans would still need to pay additional out-of-pocket for healthcare and education. 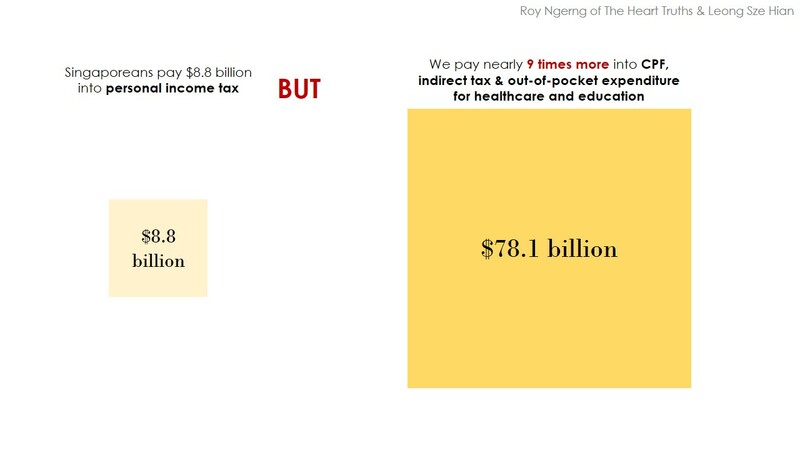 For healthcare, Singaporeans have to pay an estimated additional $8.1 billion out-of-pocket and for education, we would need to pay another estimated $6 billion (accounting for the fees that Singaporeans pay and fees for additional tuition) – in total, we may have to pay an additional $14.1 billion out-of-pocket. Now, when you add this together with personal income tax, indirect tax and CPF, Singaporeans would pay about $78.1 billion. This would be nearly 9 times more than what we pay into personal income tax! 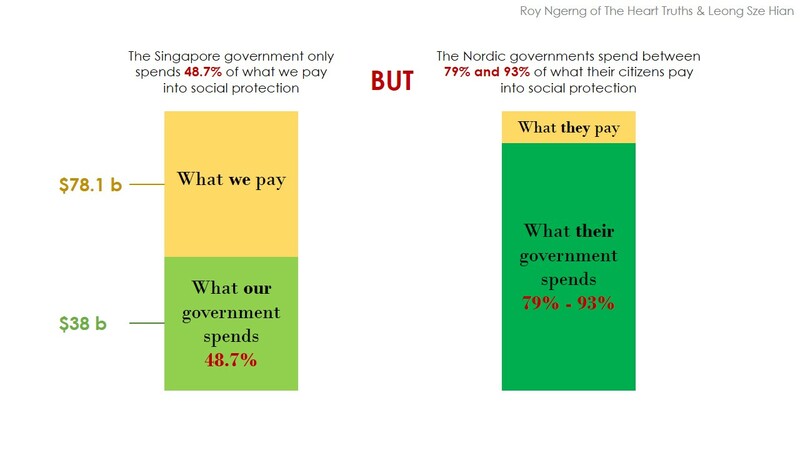 In fact, as we had previously compared, the Finns and Swedes would need to pay only about 1.5 times more into indirect tax and social security, whereas you can see that Singaporeans pay 9 times more! So, from a cash flow perspective, what Singaporeans pay isn’t low at all. But that’s not yet all. 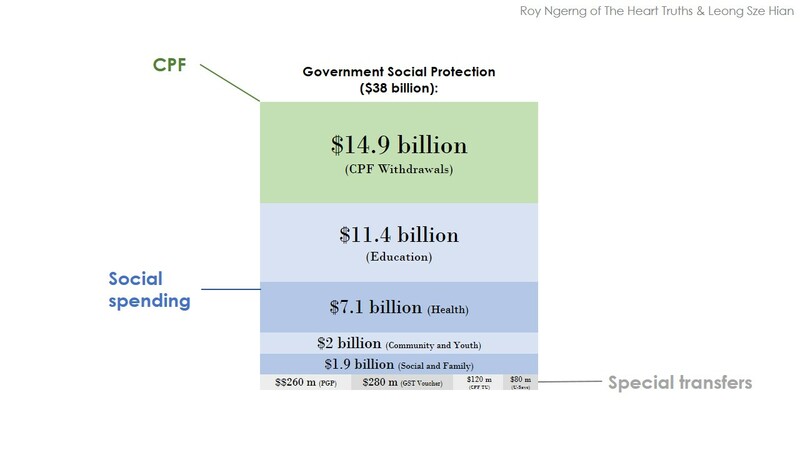 In 2014, the government would spend $38 billion in social protection (from a cashflow perspective) for Singaporeans (Education ($11.4 billion), Health ($7.1 billion), Community and Youth ($2 billion), Social and Family ($1.9 billion), GST Voucher Special Payment ($280 million), U-Save and S&CC rebates ($80 million), CPF Medisave Top-Ups ($120 million), Pioneer Generation Package ($260 million) and CPF withdrawals ($14.9 billion). So, when you look at how much the government spends ($38 billion) in terms of how much Singaporeans have to pay ($78.1 billion), the government would spend only 48.7% of what we pay. 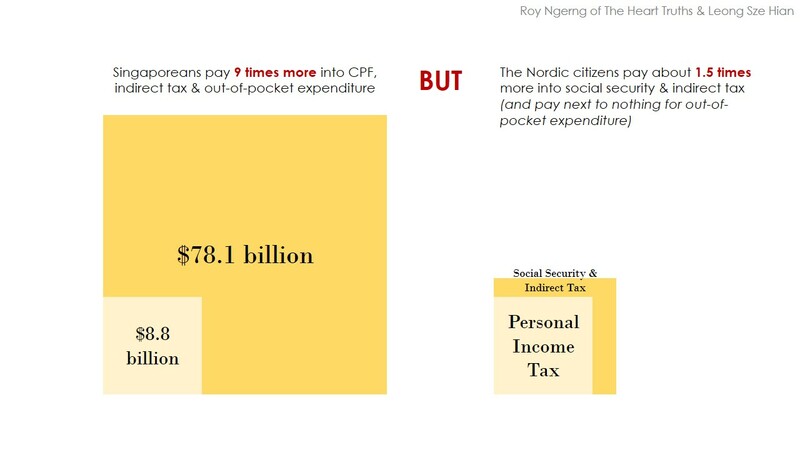 In comparison, the Nordic governments would spend between 79% and 93% of what their citizens pay. 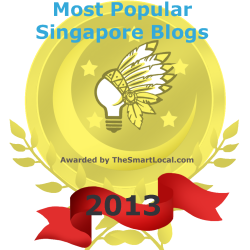 So, you see, Singaporeans might have high expectations about Budget 2014. We might have been told that the government wants to move towards a more “fair and equitable society”. However, from a cash flow perspective, things haven’t changed much. The government still doesn’t spend a single cent on providing public goods (healthcare, CPF and HDB) to Singaporeans. Not only that, we have shown you that the government had announced increased expenditures, but this increments are piecemeal and small, when compared to what Singaporeans actually have to pay. And as we have shown you, to finance the additional health expenditure that the government had announced, the 1% increase in our Medisave contribution rate would allow the government to cover all of the health expenditure, and not only that, allow them to have some spare left as well! So, what do you think? Despite all the hype in the media after Budget 2014 was announced, what we have found is that Singaporeans are still being made to foot the bulk of the bill for ourselves for any “increments” that the government is “magnanimous” enough to give. We should be thankful, right? Well, not really. Not only are these “increments” long overdue, they also fall short of what a country such as Singapore with a such a high GDP per capita should do. 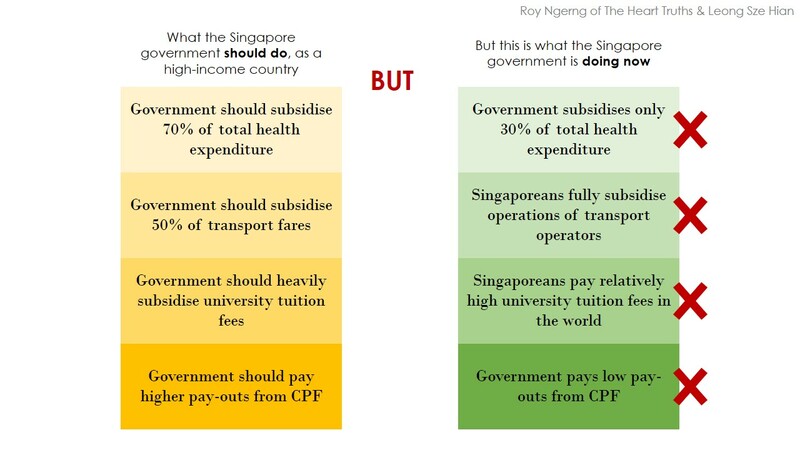 For a country as rich as Singapore, the government should be spending 70% of health expenditure and 50% to subsidise transport. Yet, the Singapore government only spends 30% of health, Singaporeans are made to fully subsidise the operations of the transport operators (SBS Transit and SMRT) and their profits, Singaporeans pay relatively high university tuition fees in the world and the retirement funds that we receive from CPF is way below what the citizens in the other high-income countries receive. A First World country? Not really. An illusion of a First World country but a Third World living standard. A government that does not need to spend a single cent while Singaporeans are made to keep paying for any increments that are long overdue to us. Uniquely Singapore! So, what will you do? Hey, i think what you mean is “government net expenditure is still 0”. Still doesn’t spend a cent makes your article less credible since government got spend. Just that it collects more than it spends. Most government also like that. If you want to point out what is wrong with our government, just say that it collects much much more than it spends on us. Like the town councils with their sinking slush fund. Collect so much that it has to invest on Lehman bonds. If they collect just enough or slightly more, there wouldn’t be such problem. Such blatant misleading title open yourself up for people to attack and dilutes the point that you are trying to make. I admire your effort though. No time to read every article as you are writing too often. 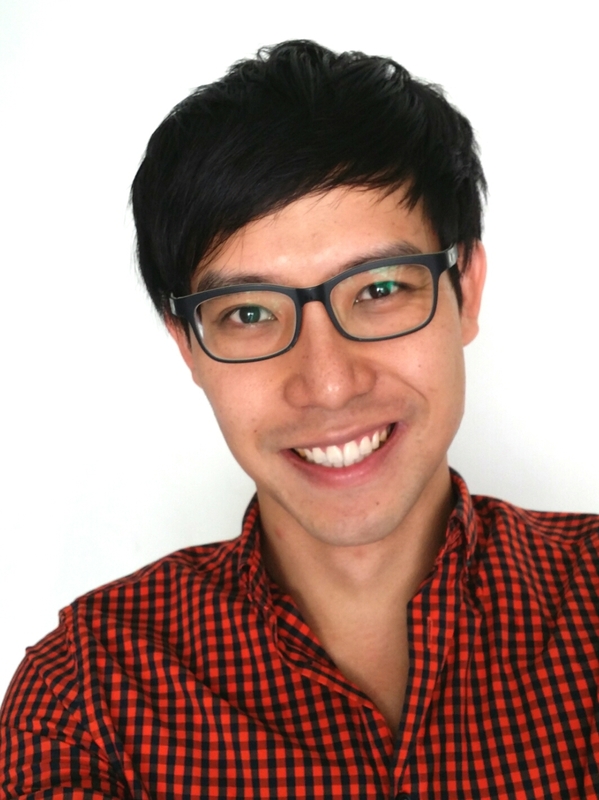 You are right – the government is earning from Singaporeans. Even with this Budget and it’s exhorted goodies, the government has still found a way for us to fund them, instead of them funding us by giving what we have given to them back. Yes, the government is earning from us. You mentioned we paid 4 times more CPF than personal income taxes and view CPF as a form of taxation. CPF employee contribution is 20% (until age 45? before it slowly decreases) Most Singaporeans bought properties are using CPF for paying their mortgage and education and maybe invest on stocks and shares. So can we still say that it is tax since we can use it for other purposes? If it is tax, we cant be using it to pay down the mortgage. If a singapore is financing his mortgage slowly from CPF and never pay a single cent of a pocket, is he still paying tax? It seems to me he is just transferring his CPF money from his account to a HDB lease for 99 years (paying long term rent). For other figures like vehicle premium tax, they mainly affect people who own cars. Most of us took public transport, so its not a tax for us. It will be more reflective on the situation for an average joe on the ground if you can show the breakdown of taxes a person who earns median income in Singapore pays (For eg, average joe earn $3000, dont drive car, own property, spend X amount of money on expenditure hence pay Y amount of GST, expected to pay how much when visit hospital etc) instead of doing the analysis by lumping the whole population together. In my opinion, it can be misleading and not truly reflective. Also on Part 1 of your essay, you mention the government did not really increase their healthcare expenditure as it is financed from 1% increase in medisave and concludes that they took money from people but then the 1% is from employer I believe, hence not taken from common people. Anyway, nice work in showing the figures. Appreciate your more detailed analysis. I think what he means is that the government has already accumulated a vast reserve, estimated to be in hundreds of billion(maybe 1 trillion), and yet, they are still making Singaporeans pay more year after year and continue to stash away ever increasing annual surplus without any shame at all. Collect $10 but only spend $2 or $3. The rest of the money into their pockets, and nobody knows just how much they have collected over the years. $1 trillion in reserves, more than $250 billion in CPF, unknown billions in HDB and and sales, and other capital investment such as Medifund. Why are you looking at the total inflows and outflows of the government? If you look at the overall picture, why do you want our government to be running a budget deficit rather than a surplus? The government is doing exactly what the government should be doing – redistributing wealth and provision of public goods. If you are looking at the specific individual, a low/middle-low income person does not pay taxes or pay minimal taxes yet enjoy the utility/GST rebates. Instead of looking at overall healthcare expenditure, shouldn’t you be looking at how the specific individual will be paying? We can question the exact mechanism of how help is provided or how wealth is distributed but i think the government is not wrong to try to maintain a budget surplus. What do you want them to do ? Declare tax-free for the next ten years simply because we have lots of reserves? Any rationale person would not want their government running on deficit. The question here is – there are trillions in reserves and billions in surplus in multiple institutions in Singapore, where if just a little was channelled back to Singaporeans, would allow Singaporeans to be protected, feel secure and be able to contribute to Singapore productivity. There are trillions and billions. Get your facts right. Even our public universities are collecting hundreds of million of surplus, much like the “wealth hoarding PAP” does, and they can raise education fees yearly! We are not wrong in saying that Singapore is run like a corporation. Nice analysis, Roy. I would like to review it more. Interesting because it appears like you’re analysing the government like a corporation, which I guess Singapore is. The solution might be opening up the system to IPO, is that too radical? Once truly “public”, it can be pressured to return value to investors with dividends. I think if Singapore were to have the transparency and accountability of other democratic governments, such as an independent civil service, independent unions, independent judiciary, independent media, the allowance of strong civil society groups, an education system that is not controlled, freedom of information and open data, we would be able to have much more accountability, and a government that would need to respect the people. The problem is – we have none of these, and thus the government can deny our rights and trample over us. An IPO is an interesting idea – perhaps a public version of it. What about defence and civil servant pay? These cost had been left out. There are billions of other cost paid by the government that have been left out. More examples, street lighting, parks maintenance, civil works on and on and on. The truth is we can only wish that the government would spend more on health care and education. First we must have the money then we can spent it. Please read my other articles. Last year, there’s an estimated $28 billion in surplus that is undeclared by the government. In the previous year, there’s $36 billion. There’s also a lot of undeclared surplus in other agencies. In fact, the surpluses that the public in universities have accumulated would allow all Singaporean undergraduates to study for free now. Please look at the statistics before claiming that money would run out – the money is there, and a responsible person would advocate for increasing the budget when the funding is there. A responsible government would declare the budget and spend it for the people if the funding is there. One other thing, having a good night sleep knowing that our brave soldiers and police (Defence Force) are watching over us is as important. And that cost a lot of money. Think about it. Of course, I think any sane person knows this. What I would like to know is HOW it is being spent. In fact, I would like to know how all our money in all sectors is being spent. Throwing chunks of money into defence and playing up the fears of security is not accountability. I don’t think you need to tell Singaporeans this when we are quite aware how important this is. What we want to know is where our money is going, and truly, what we are protecting. Singaporeans are asking questions – valid question, so it’s quite indecent to whitewash us with – “we need to spend the money because we need to”. We don’t need motherhood statements. We need to know the facts. Where is our money going, exactly.